Spotmau PowerSuite™ 2008 is a suite of computer utilities for configuring, optimizing and repairing computer systems. TWO parts: WinCare™ and BootCare™ . 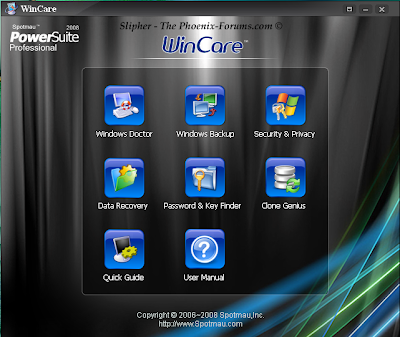 WinCare™ can run while you are in Windows. Just put the Spotmau PowerSuite™ CD into your CD drive and wait for it to run automatically or directly double click the autorun.exe.